On the occasion of Library Week and World Book and Copyright Day, Seoul Metropolitan Library will be hosting a themed book exhibition in six collection sections from April 3 to April 28, 2018. Themed book exhibitions have continuously been held in the library’s six collection sections ever since the opening of Seoul Metropolitan Library in 2012 with the hope to raise the visitors’ interest in reading and promote the library. Books are meticulously chosen out of the library’s collection according to the topic of each exhibit. April’s themed book exhibition, “A Library with Taste!”, will be displaying books centered around food and culinary culture, with a more specific topic for each collection section. ○ The exhibition will be divided into seven sub-topics: ▲ A History of the Taste of Old Times (Disability Collections), ▲ Book-eating Youths (General Collections 1 – Children), ▲ Taste of Culture (General Collections 1 – General), ▲ Tasty Books (General Collections 2), ▲ Cinema with Chef (Digital Collections), ▲ Korean Culinary Culture (Seoul Document Collections), and ▲ Welcome, First Time Trying Korean Food? (Global Collections). In <General Collections 1> two different topics will be showcased depending on the visitors. 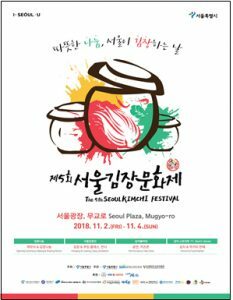 The Book-eating Youths exhibit will feature 17 books from which young visitors can learn about the cultural and global qualities of food, while 24 works on culinary culture will be available in the Taste of Culture exhibit. Going through the Tasty Books exhibit in <General Collections 2>, visitors will find 34 literary writings telling various food stories, and going onto Cinema with Chef in <Digital Collections>, they will be able to savor both delicious cuisine and moving tales through the 12 food-related movies that are expected to be on show. Anyone can visit the themed book exhibition free of charge during its opening hours (closed on Mondays). Further details can be found on Seoul Metropolitan Library’s website (lib.seoul.go.kr). For more information, please contact Seoul Metropolitan Library (+82-2-2133-0304).